On 19 May 2010, Thais army have surrounded Red Shirt protesters are including Lumpini and Ratchaprasong intersection from early morning until afternoon. There were 13 people died and hudred people wounded. As the result, United Front for Democracy against Dictatorship leaders Jatuporn Prompan and Natthawut Saikua told the protesters to return home as they surrendered. On Thursday 20 May 2010, two more red shirt leaders Tohjirakarn and Veera Musikapong, surrendered to police at 1pm. Since Wednesday 18, May 2010, thirteen people have been killed and 88 others were wounded between anti-government protesters and troops. There were a total of 50 deaths and 384 injured between 14 and 20 May, 2010. Thailand Prime Minister, Abhisit Vejjajiva, has made announcement to the public for the planning to dissolve Thais National Assembly and re-arrange the National Election between 14 to 30 November, 2010. His announcement has eased the political tense in Bangkok. 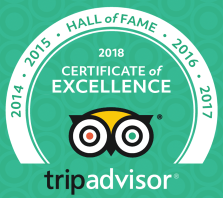 At the moment, we still recommend that tourists should get accommodation avoiding the crowded protests on Silom and Sokumvit roads until further notice. However, the protest does not affect our trip starts from Bangkok as we only transfer from the hotel in Bangkok to avoid the busy traffic and our Thais local cycling guide knows how to avoid the busy traffic to get to the point where we start our cycling. We normally stop at a gasoline station and set up our bikes and we can use the restroom also. 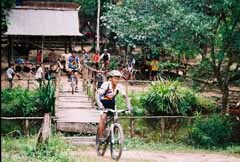 In respond to the high demand of biking tour in Cambodia. Giant has opened the first only international bike shop in Phnom Penh. 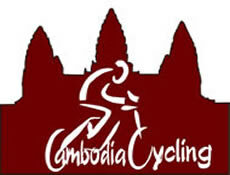 It is really good news for Cambodia Cycling and other cyclists to be able to purchase good bike and accessories inside Cambodia. So far, we have to purchase good bike from Pro Bike Shop in Thailand. The Giant Bike Shop combines 3 block of ground floor building, sells all kind if Giant Mountain Bikes and Road Bikes. 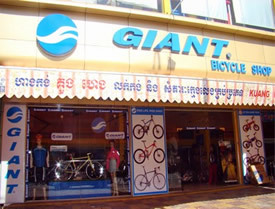 All Giant bike jersey and bike accessories are also available at Giant Bike Shop in Phnom Penh. To find out about the location of Giant Bike Shop in Phnom Penh, please contact us.